On August 1st, 1876 Colorado was admitted into the Union as the 38th state. Known as the Centennial State, it was named after the Colorado River (Rio Colorado) and has the highest median elevation in the United States. 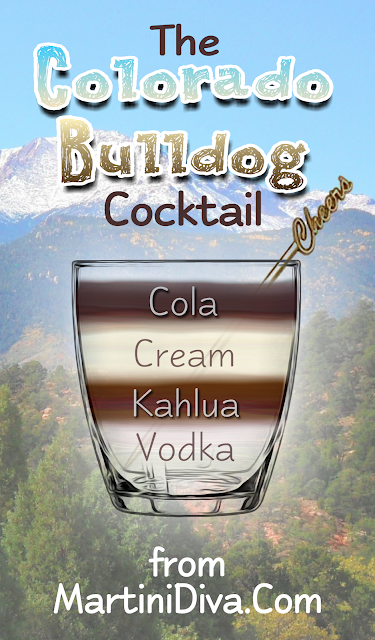 It also has its own cocktail, the Colorado Bulldog, which is a variation of a White Russian. How it got the Bulldog attached is up for debate, but I did notice there are a large number of sports teams in Colorado named Bulldogs. DIRECTIONS Combine the vodka, Kahlua, and cream in a shaker filled with ice, shake well, strain into a chilled rocks glass filled with ice cubes, top off with cola. Colorado Day is August 1st.